Hey my loves! So I have noticed a lot of girls complain about the fact that their contour is just not coming out right even though they believe they are doing exactly what they see on makeup tutorials. Yup! I said it. A lot of people seem to ignore the fact that they might be using the wrong shade of contour powder. Most people believe that once their favourite YouTube guru is using that shade, then that is what they are to use. Don't forget that a lot of times, the camera may not be showing you the true shade of someones skin tone. Try to go 2 shades or even one shade darker than your normal skin tone when contouring. 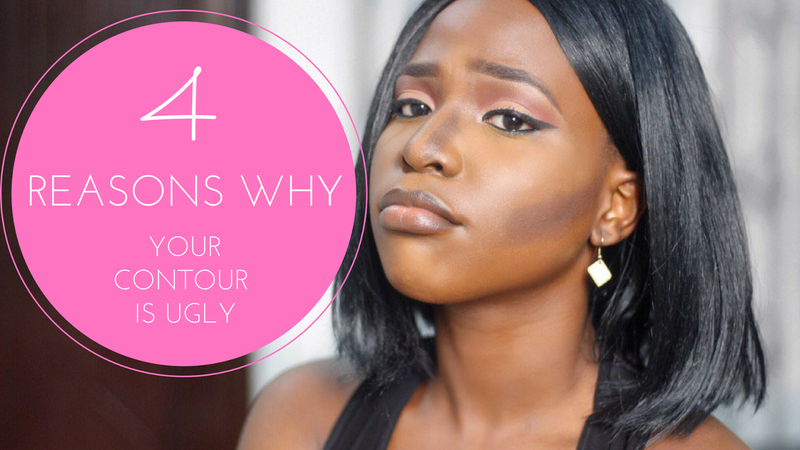 You are probably using the wrong brush to contour and you don't even know it! Personally, I prefer to use fluffy brushes that can easily blend as opposed to using a dense brush. Imagine using a flat eyeshadow lid brush to blend your crease transition shade. You will end up with a really dark and harsh transition colour. My favourite contour brush is the one from the Real techniques core collection set. I've been using it for so many years now. For some weird reason, a lot of people seem to believe that contouring is just one stripe on your face or 2 stripes on your nose. Contouring is a lot more than stripes. You need to focus on the area you are contouring and try to build up the shade while blending it in to your skin little by little. Also, a ittle ususally goes a long way. A lot of girls believe that because every makeup guru they know contours, so they also have to contour. This is not true. If you have been blessed with an already slim nose or a very well defined cheekbone, contouring is not necessary. Contouring is a corrective makeup to give the illusion of a cheekbone or a thinner nose. If you contour an already well defined cheekbone, you will end up looking very weird. Even if you feel the need to contour, it should be done very lightly.